A few weeks ago, we received the unhappy news from Maggie’s adopters that they needed find a new home for her. This was by no means Maggie’s fault. She had fit in well at their farm, behaved like a perfect lady, and given them her trust. But they felt that their daughter did not bond with Maggie. So they requested our permission to find her a new home. Out of concern for Maggie, we made the decision instead to bring her back to Safe Harbor. 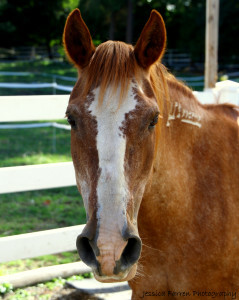 Maggie is a very sensitive, mare and trust has not always been easy for her. Thanks to the kind and patient work that was done with her after she returned to SAFE last spring, Maggie made terrific progress in learning to relax and trust. Once again, we felt the right thing for us to do was bring her back into the fold. The bright side is that she was very well cared for during her stay with the adopters, and is healthy, sound, and happy. She also seems to still be very settled and relaxed. We are already working with her and riding without issue at the walk, trot, and canter. Maggie still has — and may always have — a flight response if she feels trapped or afraid. Our goal is to help her trust and look for leadership from people. The work that we do with her is to find ways to increase her confidence and know that we are here to protect her. She nickers when I call her name and comes in from her field happy to see me. Maggie is a wise mare. She easily adapts to herd situations and she’s willing to work. She’s very smart and has a kind heart. She is in great condition for her age and is sound with fluid movement. Her sensitive nature requires an adopter with experience reading horse behavior. She’s very safe on the ground, but like most horses, she can spook or get frightened when something alarming or sudden happens. I find her really fun to work with and I enjoy our training sessions. I also really love just hanging out with her. I have to say Maggie gives some of the best horse hugs at Safe Harbor!